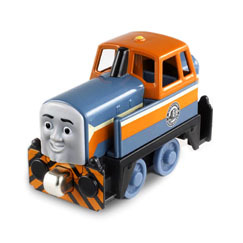 Den is a Diesel who runs the Dieselworks...when Diesel 10 is not around. He is very thoughtful and thinks hard before he speaks. When Den does speak, it is very slowly. This gives the appearance that he may be a little slow, but nothing could be further from the truth. Engines can wait a long time for Den to give his insight, but it is worth the wait.